It’s the start of July, and summertime has finally arrived to Minnesota. It’s time for fishing, camping, relaxing, and grilling. Especially grilling. Burgers. Brats. Chicken thighs. Rib eye steaks. You name it, we grill it. But what to drink with this fine grilled fare? It’s a question we get asked often, for when we grill delicious meats on our patio we have a whole warehouse of beverages to choose from. Shall it be some fine California Pinot Noir? Should it be a bold Aussie Shriaz? What about our beloved Rhone Valley? The answer we find ourselves reaching for more and more often is Zweigelt. 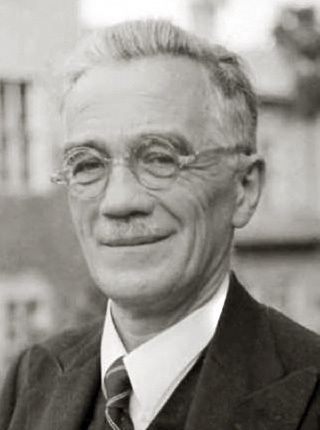 Zweigelt (TSYVE-gelt) was developed in 1922 by Dr. Fritz Zweigelt, when he crossed the St. Laurent and Blaufränkisch grapes. It was originally known as Rotberger, but the name was mercifully changed – could you imagine if we said the perfect wine for burgers was rotberger? Nearly 20,000 acres of Zweigelt are currently planted in Austria, but the variety is rarely found outside of that country (though it has a bit of a foothold in Canada). The typical characteristics of Zweigelt are distinct and unusual, which is a breath of fresh air in today’s “is it Syrah or is it Pinot Noir?” culture of commodity taste-alike wines. Aromas of violets, spicebox, punchy raspberry, and even cinnamon are common. There is a delicacy and lift to these wine, while being not at all wimpy. Acidity is a key factor on the palate, a rare quality for many red wines. Yes, Zweigelt is distinct! This aint no Merlot. Zweigelt is best served with a very slight chill to help focus the acidity. This slight chill, and having the bottle sitting in a bucket of ice next to you, is the perfect image of summertime relaxation. The brightness inherent in these wines are a perfect counter to the richness and fat of many grilled foods — it cuts richness like a sharp knife. Conversely, with a salad and a small cut of lean meat, it handles itself with respect and never overpowers the food. Is this the ultimate pairing wine? In this case, yes. 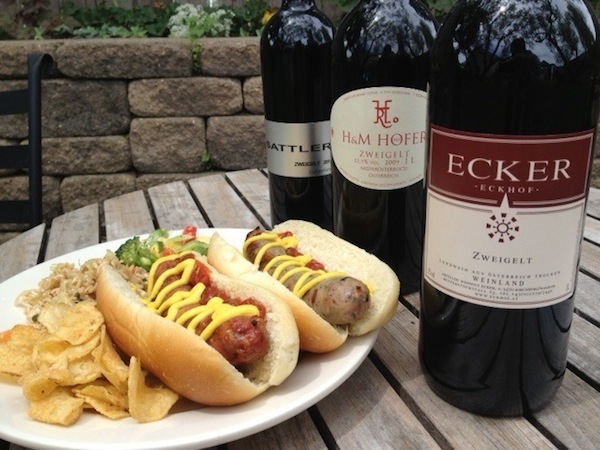 Zweigelt allows you to bring something new to the next neighborhood barbecue. People will ask what it is, especially after tasting it and realizing just how much they love it. So what Zweigelts to seek out? Here are tasting notes on three of our favorites (where to find these wines can be discovered at the end of this post). Look for them in a wine retailer’s Austrian section, which while larger than it was ten years ago might still necessitate asking where it is. Hint: try near the German section. The Germanic sounding names often get grouped together. 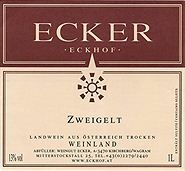 ECKER -is bottled in a liter format which means there’s even more to go around. This is what importer Terry Theise describes as: “perfect…an entirely friendly tasty wine.” It is delicious for its taut, thick skinned cherries and all the better with a slight chill. High toned fruits of the forest and enticing spice make a bright, invigorating mouthful that is poised for the summer months ahead. Yes, Terry actually did write ‘avuncular atmosphere’ … there is only one Mr. Theise, that’s for sure. SATTLER – is a more serious and sturdy version of the varietal, as lusciously charming as ever with great blackberry fruit and violet floral top notes that keep all fresh and frisky. Is has a bit more texture to its tannins than the other two suggestions, lending it a special place at the table but not so many tannins that it becomes chewy. As with the others, serve with a slight chill – it comes to life and beckons for burgers or brats. Retailers and restaurants that have purchased these wines in the previous twelve months are listed below (please call ahead to confirm availability). Accounts are listed alphabetically by city. Pingback: It Must Be a Flower Day!